A pond can bring beauty and joy to many, but a pond in your own garden can be even more enjoyable. Today I will share with you how to build a garden pond, the supplies you will need, how to choose the best location, the average price to build a garden pond, how much time it will take to build one, the best types of fish and plants to put in your garden pond, and some additional garden pond accessories you may want to purchase. I hope that this article inspires you to build your own garden pond. So let's get started. Where Do I Find Supplies? Not sure where to find supplies to build your garden pond? There are many options available to you. First, check out your local hardware stores, such as Home Depot or Lowe's. Pet shops such​​​​​ as Petco may sell pond supplies as well. If you can't find garden pond supplies there, you can look online. Either try to buy garden supplies directly online or just search "pond supplies near me." You may be surprised at how many places sell pond supplies near you. You can also try searching "pond store near me." When you search for pond supplies on the internet, you should see lots of options pop up. For example, fish pond supplies are sold by The Pond Guy, and other garden pond supplies sold by the Pond Market. Many other sites like these are found on the internet by searching "pond supplies near me," or "pond supply store near me." Before we get started on building a garden pond, we need to consider first the best spot to build it. It is important that your garden pond can get sunlight for six hours every day. Therefore, choose a location that will receive morning sun and perhaps a location that is shaded in the afternoon. Sunlight will warm the water and will stimulate vitamin and mineral absorption in fish. This will boost the colors of your fish and will make them healthier. The sunlight will also increase the growth of algae, which is an important bacteria that are healthy for fish because it absorbs nitrate from the environment. If you add plants to your pond, such as water lilies, they require sunlight too. However, make sure your garden pond does not receive sunlight all day long because this could overheat the water. Second, choose a spot where your garden pond is away from potential areas of debris. For example, you will want to avoid placing your pond under a tree. As nice as a tree looks, it will also drop leaves and blossoms will cause your pond to become clogged. 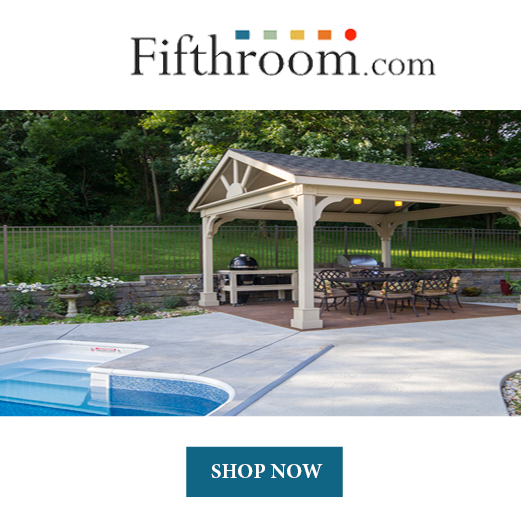 Thirdly, choose a spot that works naturally with the layout of your yard. For example, if you have a hill, try to position a waterfall in your pond so that it runs downhill. And lastly, make sure your garden pond is in view so that you can enjoy it. You may want to put it near your patio or near a window so you can view it even while you are inside. If you want neighbors to enjoy it as well, you may want to build it in your front yard. Now it is time to get building. Make sure you have all the supplies you will need ready to go. Consider where you would like to build your garden pond. 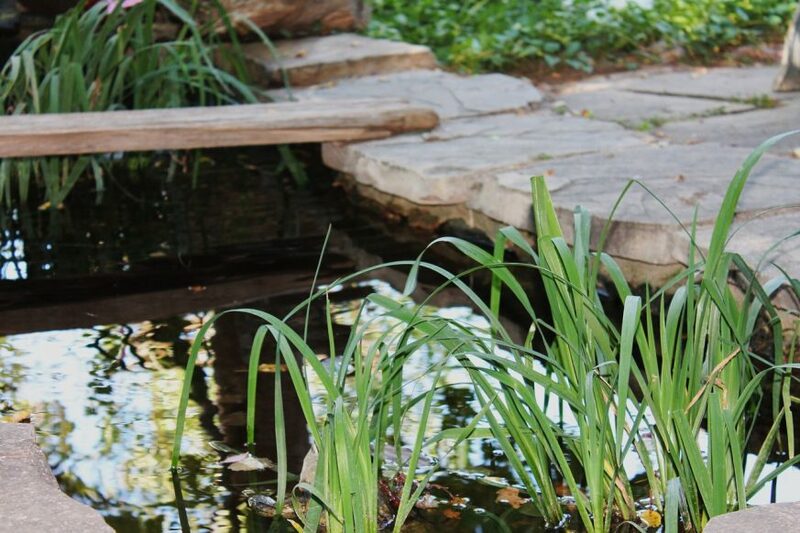 Earlier in this article, I discussed how to choose the best location for your garden pond. Lay out the size and shape of your garden pond with a rope or garden hose. Using a spade, dig down three inches in a 1-foot wide ring outside the outline of your pond. This will create the stone-border shelf. Next, create a plant terrace by digging a 1-foot wide shelf eight inches deep inside the rope outline. Only dig the terrace in areas where you will be putting the plants. Continue digging inside the plant terrace to create the bed of the pond. It should be a minimum of 18 inches deep, with a slight slope. Once you have dug out the bed of the garden pond, it is time to level it. To do this, set a 2x4 across the garden pond hole, and lay a level on top of it. Level out the pond's edges. Then, dig out a 6-inch wide, 1-inch deep channel on one side to redirect overflow. Also dig a shallow trench to the nearest electrical outlet. This will be for the PVC conduit, which will hold the pump cord. Now it is time to prepare the base of your garden pond. Beginning in the center of the pond hole, pour a 1-inch layer of sand around the entire base and on the terraced shelves. Cover the sand and the sides of the hole with a ½-inch-thick lining of newspaper to provide a protective layer under the lining. Smooth the entire surface by hand and remove any roots or stones that could bulge through the lining. Cut a piece of the liner (or some type of tarp) to be four or more feet wider and longer than the pond. Place the liner over the hole so that there is 1 to 2 feet of excess on one side and the rest of the excess on the opposite side. Set two stones on the shorter excess side to hold the liner in place. Starting at this end, press the liner down along the inside edge and then along the bottom of the hole, working your way around the garden pond. Smooth out creases and folds, and push the liner tightly into crevices. Now it is time to fill your garden pond with water. Use a garden hose to do this. Fill the pond until the water reaches the top border shelf. After you have filled your garden pond with water, it is time to install the pump. Thread the pump's cord through a section of PVC conduit cut to length. Place the PVC conduit in the trench and refill the trench with soil. Hold one end of the recirculating hose as you set the pump in the deepest part of the hole. Fill the overflow channel with pea gravel for drainage. Begin arranging flat rocks along the border so the liner's edge is covered but no more than one-third of each rock hangs over the water. Cover this first ring of rocks with a second one. Stagger the seams between the stones, and set them back from the edge of the first ring a little. Where the hose enters into the water, wedge it between two rocks. Make sure you do not crush or break it. Where the hose exits the water, wedge it between two rocks without crushing it. Add a third rock so that the hose is completely hidden. Arrange the rocks so that the hose is very secure. You may want to arrange it over a stack of rocks so that it creates a waterfall. Once the pump and hose are secure, plug the cord into an exterior GFCI outlet. Add plants in and around the pond. If you will be adding fish, now is the time to do so. I will discuss the best type of fish to buy and how to care for them later in this article. Make sure you keep the pump going during daytime hours, but shut it off at night so it doesn't attract nocturnal animals. The average backyard pond is between 200 and 300 square feet. The average price per square foot is $2.50 to $7.15. 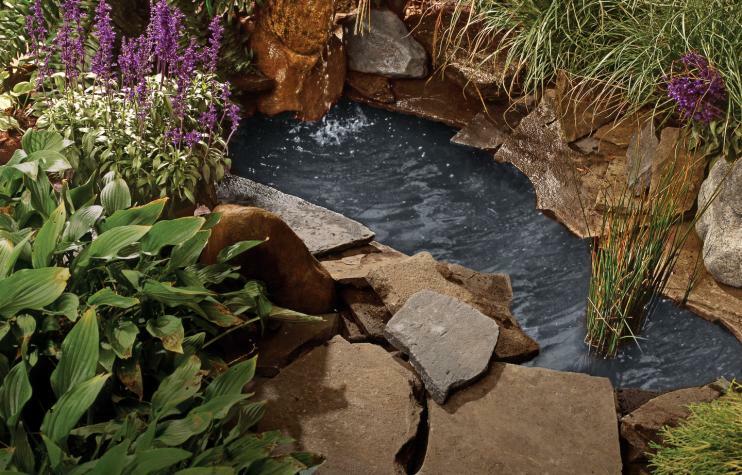 Most people on average, pay between $500 to $2,145 for a garden pond. If you are installing the garden pond yourself, of course, it is fairly cheap. But buying all the materials can be expensive, so choose carefully. Be prepared to spend approximately $1,000 when building your garden pond. But for the beauty and hours of enjoyment that the garden pond will bring, it should be well worth the price. How Long Does It Take to Build a Garden Pond? The time it takes to build a garden pond is different for everyone. Some people are able to do it in six hours. Others take a weekend to build it, or even a full week. It basically depends on how much time you put into building it every day. If you only spend a few hours per day working on it, you will probably be working on it for a week or so. However, it is possible to complete it in one day. Here comes the fun part: It is time to add the fish and plants to your water garden. It may seem overwhelming at first because there are many different types of fish and plants that can be added to a pond. In this section I will go over the best types of fish and plants to add. Remember that you don't have to add fish to your garden pond. This is just something that most people choose to do. However, you can just stick with plants if you want to. This is not a specific fish name, but rather a species of fish. Surface fish will feed at the surface of your water instead of at the bottom. This type of fish is a good choice if you want to be able to easily see your fish. However, surface fish need more protection because they can easily be caught by a cat or other predator. An algae eater will eat the algae that grow in your pond, hence the name. This fish is also called a Gobi. Gobi fish grow to be five to six inches and will live for approximately five years. The minimum depth of your pond should be 28 inches if you choose this particular type of fish. You will need to put a few of these fish in your pond, preferably about six, because they like to have the company of each other. This fish feeds on insects, worms, snails, and additionally, it will feed on high-grade quality feed that contain vitamins and minerals. Koi carps are the most popular type of fish to put in a pond. 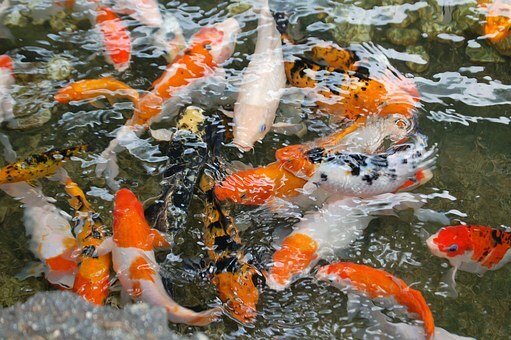 With their colorful colors, Koi carps can make your pond extra colorful and creative. Unfortunately, Koi carps cannot be put in a garden pond or any pond with plants, because they will uproot them. However, you could place your plants in floating baskets. Koi carps will grow to be 28 to 32 inches and can live up to 40 years. Your pond will need to be a minimum of 60 inches deep for this type of fish. A sunfish will grow to be four inches and can live up to 12 years. It feeds on insects, parasites, fish eggs, and additional feeding on high-grade quality feed with vitamins and minerals. Your garden pond must be at least 28 inches deep. It is recommended that you only have one sunfish in your pond. Besides Koi carps, goldfish are one of the most popular fish to put in a pond. You should have at least five goldfish, but make sure you only have five goldfish per 1,000 liters of water. Goldfish can grow up to 14 inches and can live up to 30 years. Make sure your pond is at least 40 inches deep. They feed on easily digestible high-quality feed with vitamins and minerals. 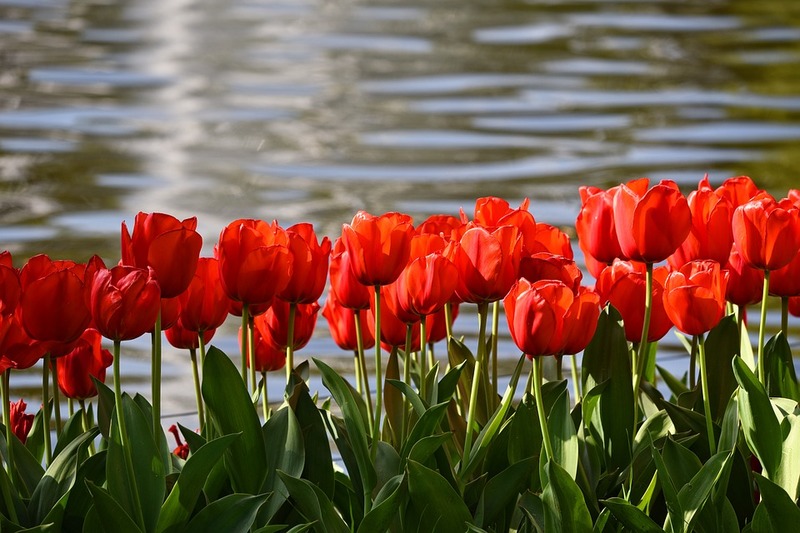 Here is a list of some good aquatic plants to put in your pond, as well as some land plants to put around your garden pond. The creeping phlox is a great plant to grow near your garden pond. 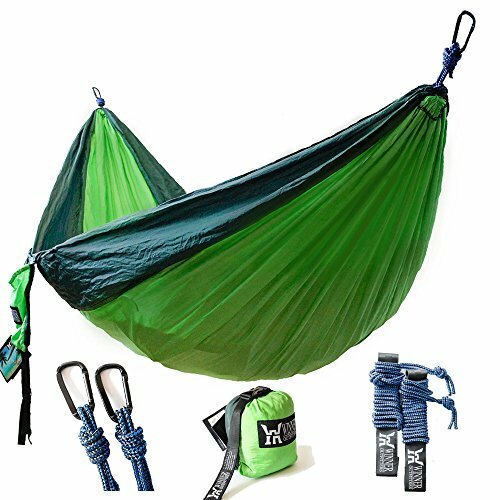 There are many fun and creative pond accessories to buy. Pond accessories can bring a creative look to your water feature and will make the pond look extra special. In this section, I will share some fun garden pond accessories that you may want to consider adding. Statues - Fun statues and sculptures can add a creative look to your yard. Examples of statues you can get include a cat, elf, fish, turtle, and many more. Blue Dye - Some people add blue dye to their pond so that their pond looks extra clear and blue. You can get blue dye on Amazon that is safe for koi carps. Solar Lights - If you want to make your pond extra beautiful at night, consider adding some solar lighting. 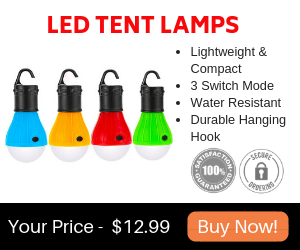 You can get solar lights in creative shapes and sizes. Fairy Garden - Some people like to add a fairy garden to their garden pond. It certainly does make the garden pond appear more magical. Pond Test Kit - Make sure the water in your pond is clean by using a pond test kit. You can buy a kit from Amazon by clicking here. Glow in the Dark Pebbles - Want to be really unique? Get some glow in the dark pebbles. Your neighbors will be jealous! Bubbles - If you don't have a waterfall in your pond, or if you want more movement in your garden pond, a bubble disk is the way to go. Set the disk in your pond and watch the bubbles float to the surface of your water. I hope that this article has inspired you to build your own garden pond. As you can see, it is not nearly as difficult as it seems. Simply plan out the area you want to build it, dig it out, lay down a liner, add the water and some rocks, and you are ready to go. I have listed the steps to build a garden pond in this article, as well as how to choose a good location and the supplies you will need. I also discussed how much it costs and how much time it takes to build a garden pond. I listed the best types of fish and plants to put in your pond and great pond accessories to add. I hope that you are inspired and will consider making your own. A garden pond will bring so much enjoyment and beauty to your yard. So go get building!